The group of senior citizens dipping test tubes into the Wissahickon Creek has their work cut out for them. As members of the Senior Environment Corps (SEC), a volunteer organization housed at Center in the Park—an active adult community on Germantown Avenue—these volunteer men and women are environmental watchdogs. You’re as likely to see them running a battery of tests from the banks of local rivers, creeks and streams on the hottest days of summer as you are during winter’s deep freeze. Theirs is a year-round job. No one gets paid. Just about everyone’s old enough to collect Social Security. And ever since the group partnered with the Philadelphia Water Department to keep an eye on local waterways throughout the region, their impact on our ecosystem is undeniable. Five miles from the senior center in Northwest Philly, where the group regularly convenes for meetings and socials, is Fairmount’s historic RittenhouseTown, one area where SEC patrols for pollution and other environmental hazards that plague the urban ecosystem. For more than 200 years, working mills—including one of the first-ever paper factories in the U.S.—dumped wastewater upstream into the Wissahickon. Many decades later, this still creates ecological concerns. But thanks in part to SEC’s work, vital waterways like this one have been put under a microscope—literally. For 12 years now, these energetic seniors have conducted monthly water testing, habitat assessments, tree plantings, watershed tours and educational outreach at schools and within the community, all with the goal of calling attention to Philly’s natural resources. For most of these folks, going green is hardly a new concept. They’ve been chronicling the impact of environmental initiatives long before green even became a household word. Led by Fred Lewis, a charismatic 81-year-old, the volunteers average in age from 55 to 85 and come from all walks of life. There’s a former bus driver, social worker, amateur paleontologist, Harvard-trained chemist and several retired grade school teachers, computer geeks and homemakers in the group. 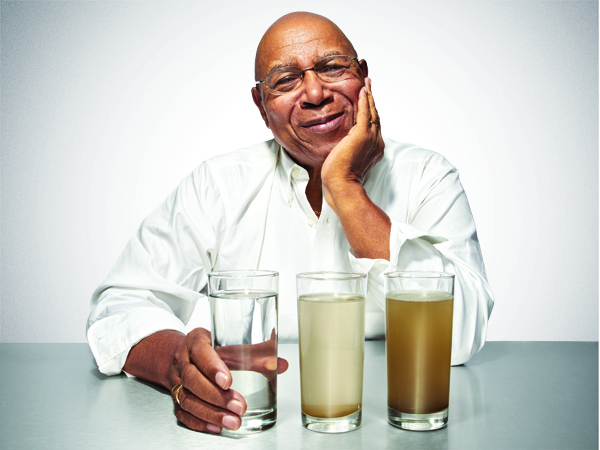 Lewis himself is no stranger to environmental concerns, having spent a lifetime rethinking better water treatment practices as a management consultant in the laundry industry. He’s come to anticipate all the usual environmental afflictions over the years, and has found new ways to surmount the seemingly impossible: by calling attention to these ecological issues to anyone who will listen. “This is an urban area,” admits Lewis, who’s been working with the group since 1997 as volunteer coordinator. “There’s a certain amount of pollution you’d expect to find in urban streams because of runoff.” He’s seen everything from dead fish and chemical leaks to old tires and discarded refrigerators floating through Philly’s waterways. A few years ago, SEC discovered untreated wastewater in Monoshone Creek after noticing an unusually large number of dead animals and dwindling plant life. Their quest to bring this serious environmental breach to the attention of the Philadelphia Water Department was eventually chronicled in a documentary, Knee Deep, directed by Ann Tegnell and Sharon Mullally. “That resulted in getting the community involved and the water department involved,” says Lewis. It eventually cost the city at least a million dollars to reline the sewer, which, he says, has improved the situation significantly. But it hasn’t corrected it entirely. He and other volunteers still regularly test the waters for wastewater leaks that could impact drinking water, fishing and swimming. The group’s dedication to the environment is obvious to anyone who spends any time with the members. They are eager to give back to their community, a city where many have raised children and grandchildren, and worked lifetimes in public service and the private sector. Despite arthritis and two knee replacements, Lewis is more involved than ever with environmental causes. When the octogenarian’s not out in the field climbing up and down rocky river banks and trudging through rain and snow with his test tubes and pH strips, he’s active in almost a dozen other organizations and boards of directors, including the Pennsylvania Horticultural Society, Wissahickon Watershed, Water Department Advisory Council, Retired Seniors Volunteer Program and the Delaware Estuary, to name just a few. For those seniors who may be limited by physical ailments, SEC has opportunities to work in the lab and the office, answering phones, mailing letters and supporting the needs of the program. Lewis says there’s a job for just about anyone, whether you enjoy visiting local parks and rivers or prefer being indoors in the office and at schools. Harris says the center’s daily attendance averages upwards of 220 members a day among seniors who visit to volunteer, take classes, share lunch, socialize and exercise. “We’re continuing to see a steady growth in our membership,” she says, with an average of 30 to 40 new seniors signing up each month thanks to community outreach among groups like SEC. In its quest to heal Philly’s local ecosystem (or at the very least, police it), SEC covers a lot of terrain. “We monitor one end of the city to the other,” says Lewis. “We go as far north as Chestnut Hill College and as far south as John Heinz National Wildlife Refuge.” The seniors also monitor the Darby and Cobbs Creeks and Saylor Grove, as well as the Delaware and Schuylkill Rivers and other smaller streams and tributaries throughout the park system. Neukrug, who’s known Fred Lewis for years in the water world, is in the process of rolling out a new green program for Philadelphia that will essentially analyze every square foot of the city, with the goal of capturing the first inch of storm water via rain barrels, vegetative roofs and other eco-friendly technology. The water will eventually be repurposed, preventing it from running into local waterways along with the pollution it picks up, like oil from vehicles and other chemical residue found on city streets and riverbanks. The department is also experimenting with curb bump-outs and irrigation tactics that would prevent runoff into rivers that supply drinking water. According to Neukrug, the city of Philadelphia consumes an average of 200 million gallons of water each day, half of which is harvested from the Delaware River, the other half comes from the Schuylkill River. “Understanding the value of the land upstream from us is important,” he says. “We’ve done a lot of analysis of the most critical areas of our watershed.” The SEC is instrumental in following up with water monitoring results each month. They essentially report to the water department in cases where changes occur in addition to the regular testing being done by water department employees. “One of the biggest issues is wet weather,” says Neukrug. “When we started this organization, we met with folks at the Tinicum Wildlife Refuge. We were concerned about Cobbs Creek since it empties into the refuge.” He says there have been issues with bacteria and heavy metals in these waterways, as well as some surprising discoveries from decades past that can kill animal and native plant life. When the seniors at SEC test these same waters, they may end up finding high levels of bacteria and contamination as the result of common household pollutants. The good news, according to Neukrug, is that the watershed, water department and organizations like SEC have made noticeable progress. “Our rivers and streams are cleaner than they’ve been in 200 years,” he insists, pointing to the Fairmount fish ladder, an artificial underwater barrier that encourages natural migration, as proof. Not only is the fish ladder attracting more fish, but also a wider variety of species, including American shad. “We’ve been seeing an increasing number of fish from the Delaware Estuary,” he says. The fish are healthy and reproducing—so much so that the Watershed recently assigned an intern to the tedious job of counting fish using a camera installed to study the ladder near the Fairmount Waterworks. He also says fish docks were overexploited, declining the number of migratory fish in local rivers. “The removal of key dams has been important,” says Cruz, because now fish raised in hatcheries are released and swim upstream where they spawn naturally. After studying many of these ecological improvements and hiccups over the years, the group has begun drafting educational programs for local schools that combine textbook learning with outdoor explorations. Johnnie Henderson, SEC’s educational coordinator, has been using her experience as a retired schoolteacher to create more hands-on programs that can be used to teach about science and ecology. Henderson herself has always been interested in science and nature. And like most volunteers, she was looking for something constructive to do after retiring from teaching. “I retired to something from something,” says Henderson, who now helps to create lesson plans with principals and teachers who are interested in adding ecology to the curriculum. “We visit the schools and take the children on trips,” she says. Past field trips have been to the Waterworks, Chestnut Hill College and Fairmount Park, where students learn about the local ecosystem and the impact of pollution on water, animals, plants and each other. “We sometimes visit the schools and help create native habitats,” Henderson adds. SEC works with the administration and students to plant trees and other foliage so that students can learn about the advantages of native species, as well as do hands-on lessons in real nature labs. The Ivy Leaf School on East Washington Lane received one of SEC’s nature labs recently. Henderson says not long after the foliage was planted, children start seeing butterflies and birds in the schoolyard—all of which they studied in their science classes. “A lot of parents also become interested,” says Henderson, especially when the students learn about recycling and the impact of pollution on local waterways. SEC works with schoolchildren to not only test water, but also label sewer outlets, which lets their own families and neighbors know that the sewer is connected to Philly’s drinking water. Lewis says this learning process is a two-way street for the students and seniors alike. And the common denominator is the environment, and a need for both young and old to take active roles in the community.